Heat the soy milk in a small saucepan until it bubbles, then remove from heat. Mix in margarine; stir until melted. Let cool until lukewarm. In a large mixing bowl combine 2 1/4 cup flour, yeast, sugar and salt; mix well. Add water, cornstarch, and the soy milk/margarine mixture; beat well. Add the remaining flour, 1/2 cup at a time, stirring well after each addition. When the dough has just pulled together, turn it out onto a lightly floured surface and knead until smooth, about 5 minutes (I put mine in a food proccessor instead of kneading). Roll out dough into a 12x9 inch rectangle. Spread dough with margarine/sugar mixture (if you want you can add in some raisins or nuts). 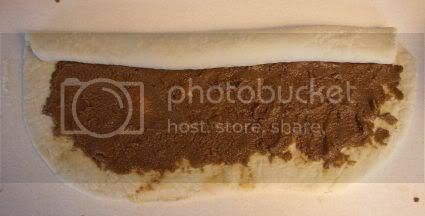 Roll up dough and pinch seam to seal. Cut into 12 equal size rolls and place cut side up in 2 lightly greased rounds pans. Cover and let rise until doubled, about 30 minutes. Preheat oven to 375 degrees F (190 degrees C). Bake in the preheated oven for 20 minutes, or until browned. Combine all the ingredients for the glaze in a small bowl and mix until smooth. Let rolls cool a few minutes then drizzle with glaze. You made my day! I was home with my sick four year old all day. After a whole day being cooped up in a house, a little kid gets pretty restless - and whiney. She saw a commercial for cinnamon rolls on TV and promplty declared that she wanted some. 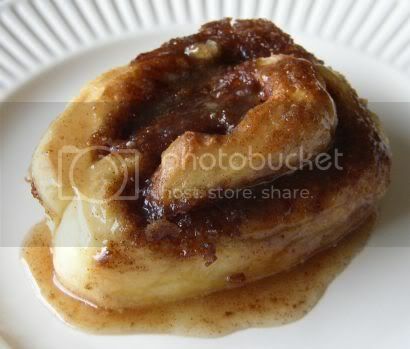 So I looked through my vegan cookbooks and on the IVU website, but there were no recipes for vegan cinnamon rolls! I found your site through yahoo. Making the cinnamon rolls kept my daughter entertained, which saved my sanity. The pictures were so helpful. But most of all, the rolls were delicious. My non-vegan step-dad says they are the best he has ever had and my family has requested them again and again. Thanks Meg, you're the bomb! I adapted your recipe and made these cinnamon rolls the other day. They turned out wonderfully! Thanks for this recipe - it's really great! I'm not a great cook, but these were so good people asked for the recipe. I've made it twice now, and I think it's going to be a Christmas morning tradition from now on! Also, I used raisins, which turned out great. I used dark brown sugar since you didn't specify which kind; not sure if it matters. Hey, I made these tonight with my little bro.. and they were awesome! My Dad enjoyed them too. Not being the cook of the house, I was nervous about trying a delicate baking experiment. However I found your blog post here and was determined to make it work. I followed it to the "T" and I must say - WOW! - these turned out incredible. I did have to use the dough mixer to 'absorb' all of the flower before the initial rise, but everything worked great. Thanks for making me and a few of my vegan friends day with this one! I was glad to share and look forward to making these again - maybe with a twist. I didn't know you had a blog! I would have thanked you for this recipe a long time ago. 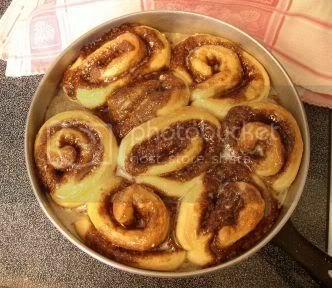 These are the greatest cinnamon rolls ever and my favorite treat of all times! These are the best cinnamon rolls I have EVER had! I think this recipe deserves an award! :) I TOTALLY reccomend. for my cinnamon rolls are one of the best desserts out there, and apart from that are easy to prepare, you can buy any pastries. Nummers. I made these this morning to ring in the fall weather... soo good. I used 1 and 1/4 cup whole wheat pastry flour instead of all white flour. It gave the rolls an incredible grainy and wholesome texture, but don't get me wrong, still totally sinful. I didn't have any cornstarch so I used 2 Tbslpns rice flour-a good substitute. Will put this is my all time faves. I cannot believe these are vegan! I've been enjoying these for years now- thanks so much! Thanks for this article, really worthwhile material.